Bar some unexpected intervention, the UK will be leaving the European Union next March. That is what the electorate voted for in 2016. 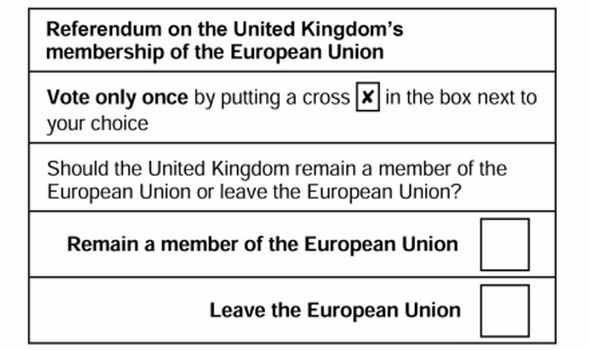 It said so on the referendum ballot paper. So it's disingenuous that politicians continue to claim that the electorate voted for something else. "When the British people voted for Brexit, they voted to take back control." I'm sure most of them did, but it was never clear what "taking back control" actually meant. "When the British people voted for Brexit, they voted to cut immigration." I'm sure many of them did, but if you'd written that on the ballot paper, it'd never have got a majority. "When the British people voted for Brexit, they voted to leave the single market." I don't think you'll find they did, because it was barely mentioned at the time. "When the British people voted for Brexit, they voted to get their voices heard." Sure, but “Leavers” were a wide body of different people, and all had very different motivations. "When the British people voted for Brexit, they voted to shape a brighter future for our country." Obviously everyone was voting for that, including those who voted Remain. "When the British people voted for Brexit, they voted to regain sovereignty." That's a meaningless buzzphrase, laden with whatever meaning the audience wants to hear. "When the British people voted for Brexit, they voted to take back control of money, laws and regulations." No they didn't, that's a politician stamping their own personal view onto the overall result. "When the British people voted for Brexit, they voted to end the free movement of people, to stop sending billions and billions of pounds to the EU each and every year, and to make our laws in our own country, judged by our own judges." Again, no, that's a politician justifying their intended policies by pretending the referendum gives them full endorsement. "The agreement we reach with the EU must respect the referendum. It was a vote to take control of our borders, laws and money. And a vote for wider change, so that no community in Britain would ever be left behind again." That was the Prime Minister in her big speech yesterday, again claiming to know exactly what the British people voted for, after twenty months of vacillating indecision. But there never was a Brexit plan back in June 2016. There still isn't. All there is now are politicians pushing their own agendas and claiming they have the backing of the country. Voices on both sides of the traditional political divide are guilty of this. Labour leaders support Brexit because dismantling EU controls is the only way to bring about left-wing nirvana. Hard-line Tories support Brexit because dismantling EU controls is the only way to bring about free-trade nirvana. For all these politicians Brexit is a golden opportunity to eliminate previously inviolable rules, taking the country in a direction which suits their long-term interests, which isn't what the country voted for at all. Whenever you hear a politician claiming to represent "the will of the people", and that to disagree with them is to "disrespect" the mandated outcome, they're openly manipulating what the referendum was actually about. The only thing the referendum confirmed is that the electorate wanted to leave the European Union. Every subsequent interpretation is nothing more than political expediency, and the further we push into this mess, the more important it is to remember that.